I sat down with Ben and Alex from Bad//Dreems at the Exeter on Sunday the 18th of May before the second Adelaide show of their national Dumb Ideas tour. Bad//Dreems have been tearing the local scene a new one lately with notable shows and a local slot at Oakbank’s Groovin’ The Moo! The good thing about music compared to other creative forms is that music can hit you in an instant. A good song can convey a feeling in two and a half minutes. It doesn’t matter what style of music or if there are vocals or not. If it can communicate that message effectively it’s a good song. Bacon! The right amount of cheese. Basically the meat. The buns have to be soft and everything has to make sense. Maybe some salty avocado too. 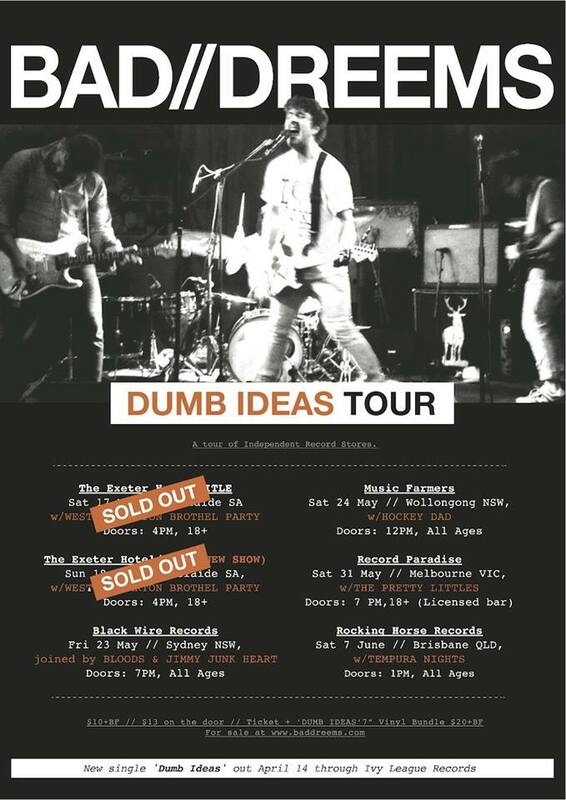 Tell us about the Dumb Ideas tour! We’re doing a record store tour. We’re off to Sydney, Wollongong and then Melbourne and Brisbane. Finally we’re going to support a larger American band. After that we’d like to head to the states. The USA! Are you looking at headline shows or support slots and festivals? Anything! It will be based around CMJ (College Music Journal), which is similar to South by South West. Music like ours is played on college radio stations across each state in America. Your music would appeal to a college demographic. We think so, and we hope so. They seem to be playing more underground Australian acts such as the Twerps and Royal Headache. Instrumental music seems to be coming back over electronic. Do you guys get into electronic music at all? We like all types of music. I like making guitar music more. You record it exactly as you play it live. We don’t want to screw around in the studio or with a computer. We like a lot of hip hop though. What can people expect who haven’t seen you live before? Lots of energy I suppose. A little messier than the recordings, but lots of feel. It’s fairly similar to the recordings. Our drummer works hard and sweats a lot. People enjoy watching that! Any last words or things to say? If anyone reads this and wants to come to a show come and say hi and have a beer with us. We’re good blokes! If more girls came to the gigs that would be sweet, but we don’t care so long as people come!